The Medical Officer of Health and Public Health Unit staff will assess the notification and determine if further follow-up with the patient is required. Primary care notifications allow identification of substances which are causing harm, and can lead to public health action to prevent disease or injury. For example, exposure to lead from deteriorating lead-based paint can be reduced through a range of remedial actions. Some controls may be regulatory; for example, the sale of highly alkaline dishwashing powders was prohibited in 2007 following increased reports of oesophageal and upper airway injuries in children who ingested this powder. An electronic notification system exists for general practices to report cases of disease and injury related to exposure to hazardous substances, including lead absorption. It was developed by bestpractice Decision Support (BPAC Inc) and the Centre for Public Health Research, Massey University and is funded by the Ministry of Health. The notification system was introduced progressively throughout New Zealand in 2013. 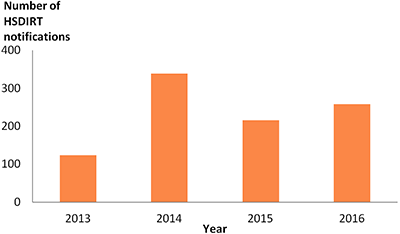 Since then, over 200 cases have been notified every year (Figure 1). Any diseases or injuries that are caused by exposures to hazardous substances should be notified. A hazardous substance is anything that can explode, catch fire, oxidise, corrode or be toxic to humans, as defined in the Hazardous Substances and New Organisms Act 1996. This definition does not include medicines in finished dose form, alcohol other than industrial alcohol, or radioactive materials. Look for the “Hazardous Substances and Lead notifications” module on the bestpractice Decision Support dashboard. Submitting the form will send it to your local Medical Officer of Health via a secure system. If your practice does not currently have access to this electronic form, contact your local Public Health Unit to notify them of a case. The team at the Environmental Health Indicators Programme, Massey University, run a hazardous substances surveillance system for New Zealand. This system monitors diseases, injuries and deaths from hazardous substances exposures. calls to the National Poisons Centre. The Depression in Young People module addresses the identification of common mental disorders and the management of depression in primary care.